Making like Marco Polo, my eastern odyssey continues with a brief stop-over for a pint of product from the Tsingtao Brewery Company of Qingdao, China. And product pure and simple is what this is. Tsingtao beer is made a in factory built by Germans a hundred-something years ago, donated (along with a Pilsner recipe) to the followers of Mao some years later. 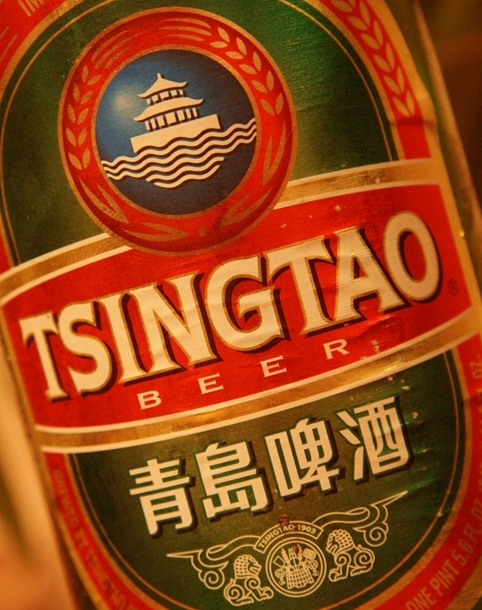 Apparently this is the top-selling Chinese beer in the U.S.A., accounts for over half of China’s famed beer exports, and is the number one branded consumer good exported from the People’s Republic. Given the size of the US trade deficit, that’s gotta be a heck of a lot of beer. Anyway, onto the booze – it’s a pleasing lager colour, with a definite lager-like aroma and and a clean lager taste. Actually, it’s got a bit more taste than most domestic US lagers, which makes for an decent change. But in the end, it’s still a fairly plain lager. From a factory. Can you tell I’m having a hard time to find much to say about it? There’s nothing to complain about, but nothing particularly special either. Sorry Tsingtao, I did want to like you. I’ll drink you again in a restaurant with dinner, or if ever I’m in China, but I don’t think you’ll often find a place in my shopping trolley. This entry was posted in China, Lager, Pilsner and tagged China, Chinese beer, Middle of the Road, Qingdao, Tsingtao. Bookmark the permalink.